Successfully Added EDGE Wireless Modem for Laptops, Notebooks and Netbooks to your Shopping Cart. 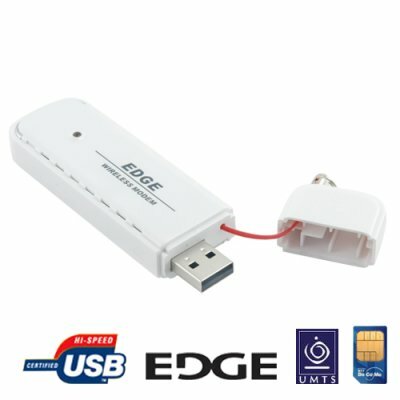 EDGE Wireless Modem for Laptops, Notebooks and Netbooks. The EDGE USB modem is a quadband wide range (850/900/1800/1900MHz) wireless modem supporting all the different frequencies used by EDGE and GSM/GPRS networks worldwide. Designed to be used anywhere, anytime to access a network, only EDGE coverage and a SIM card are required for worldwide roaming and global connectivity. Designed to be compact and portable, the EDGE Wireless Modem offers you the freedom and convenience to have access to critical information when you are located on both EDGE and GSM/GPRS networks. Requiring no software from CD to be installed, the CVBJ-K34 EDGE Wireless Modem will auto install the Mobile Connect software directly from the modem to maximize your convenience. Full support for DATA and SMS functions are provided with the user-friendly software. And with low power consumption, this great device is designed with notebook and netbook use in mind. Use it in the park, on the bus or anywhere you want! Perfect for accessing email, browsing the Web, shopping online or chatting with friends, the wireless modem provides superb connectivity ensuring you stay connected while on the move. The CVBJ-K34 EDGE Wireless Modem for Laptops, Notebooks and Netbooks is proudly brought to you by the leader in China Wholesale Electronics, Chinavasion. Order this great USB modem today and at a great factory direct price and enjoy the benefits of connectivity while staying mobile. What does auto installation software mean? When you connect the CVBJ-K34 EDGE Wireless Modem for Laptops, Notebooks and Netbooks to your Windows PC, the software will install directly from the modem without having to use a CD. This makes it more convenient to use the device on different notebooks and netbooks, ensuring you have maximum mobility without sacrificing functionality. What kind of download speeds can I expect with this HSUPA wireless modem? This modem supports download speeds of up to 7.2Mbps. Actual download speeds depend on factors such as your service provider, your proximity to the base-station and how many other people are sharing the overall bandwidth. Can I use this modem for downloading movies and playing massive multiplayer games on the internet? No. At the speeds current networks support, this modem is perfect for functions like browsing the internet, sending emails, and chatting online.